A soulful, beautiful transmission of the Divine…Mystical Kirtan with Mirabai Moon offers a passionate embrace of the Divine Essence right here, right now… in your embodied, human form, just as you are. Mirabai’s immensely versatile and powerfully expressive voice takes listeners on a journey, flowing effortlessly from ethereal dreaminess to soulful blues. She honed her craft studying vocal improvisation with Jazz legend Bobby McFerrin. 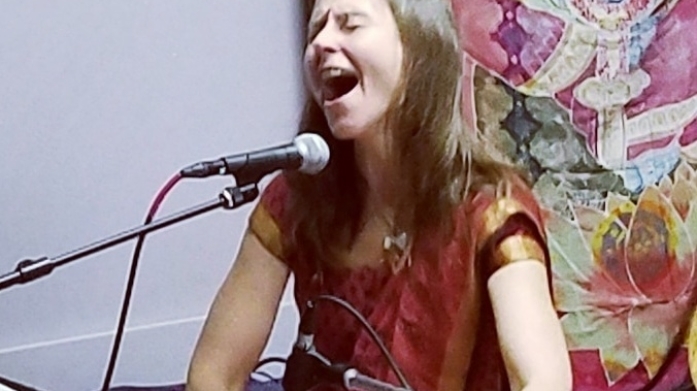 After nearly two decades of songwriting and three original albums, she fell in love with the practice of Kirtan. In 2010, Mirabai devoted herself as a Bhakta, sharing her love of the Divine with others through sacred chant. Mirabai tours internationally, sharing kirtan and sound healing. Her offerings guide participants into experiences of profound healing and unconditional love through Bhakti Yoga practices.